Can I Overcome Addiction With The Help Of A Treatment Center? Many individuals who use drugs and/or alcohol, experience a variety of negative emotions such as depression, shame, guilt, and anger. These issues can cause such unhappiness that the individual may seek help to quit or moderate their usage. 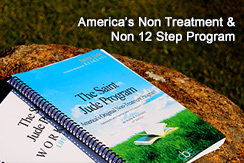 Many enlist the help of a 12 step residential treatment centers or any other 12 step based programs. However, this is not beneficial because all 12 step programs are based on the Control Model and attempt to control how individuals think and behave. For many reasons people think they can overcome addiction with the help of a treatment center, when quite the opposite is true. When searching for a substance use program, it is important to choose a program that is based on the Freedom Model. A Control Model aka treatment-based substance use program, whether residential or outpatient, is based on the philosophy that substance usage is a disease or a sickness that cannot be overcome without belief in a higher power such as religion and ongoing support group meetings. 12 step rehab programs can oftentimes be punitive in nature as well. Attendees are frequently isolated from their families and loved ones with very little contact. When in disagreement with any of the 12 steps and if vocal, an individual can be deemed non-compliant and lose what little phone time they may have or other privileges. The Freedom Model, such as the Freedom Model Program, puts the power where it belongs, in the hands of the individual. The Freedom Model Program is based on the philosophy that substance usage is a choice, not a disease. The Retreats provides a homelike environment that is positive with privileges such as cell phone and computer usage. Guests are treated with kindness and a free to think as they chose.They learn they have the power within them to self change and make more productive choices and develop behaviors and habits that are enriching and positive to their lives. Freedom Model's Freedom Model builds self confidence and guests become self sufficient as they discover that they can have a life that is permanently free from drug and alcohol use. Additionally, guests address their emotional issues as they determine their destructive thought and behavior patterns that are causing their unhappiness. They have a unique opportunity to make the necessary changes in their thought process in order to move forward and build a plan that allows them to move on and live a happy, fulfilling life. Unlike the Control Model, Freedom Model's will never tell an individual how to think or behave, but instead will provide the truth about substance usage and then a process that has been independently verified. Whether using drugs or alcohol, the Freedom Model and Freedom Model's offers substance users the best chance at success.